This is what I made for our wedding anniversary! The above recipe says to remove the skin but I did not bother. 1) Preheat broiler. Cover pan w foil, makes clean up much easier. 2) Spray foil/pan with a bit of cooking spray. 3) Wash and pat dry fish. Season w salt and pepper to taste. 4) Combine ingredients #3 through #9 in a small bowl. Lighly coat the fish--don't put too much or the fish will burn under the broiler. 5) Broil fish about 4 inches from flame till browned, 3 to 5 minutes. Pour remaining sauce on top of the fish and bake the fish at 425F till fish is flakes in the thickest part. 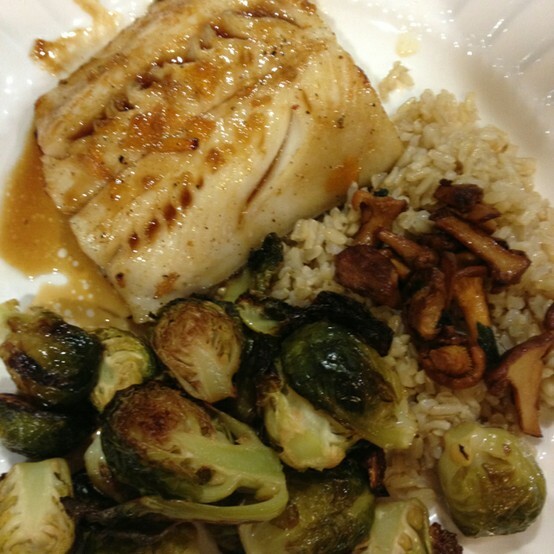 Don't flip the fish over, this allows the glaze to caramelize on top. Chanterelles are such delicious little mushrooms, if you can get your hands on them, I highly recommend them. They are tasty over rice or potatoes --you really need another side w them since they shrink so much. Remove the dirty part from the stem of the chanterelles. Wash and dry them. Preheat pan, cook shallots in oil till they begin to brown a bit, add mushrooms, cook till they shrink a lot. Salt and pepper to taste. Ground ginger (if you wish). Brussel sprouts (as much as you think you will eat), I always make extra and reheat the leftovers the next day. Grape oil--1 to 2 tablespoons depending on how many brussel sprouts you plan to roast. Preheat oven to 425 F. In the meantime, peel outer layer from sprouts. Half or quarter them depending on size. In a bowl, toss w oil of choice. Stick in the oven and turn every 15 minutes or so. Once they are brown, you can turn the oven off and I sometimes leave the sprouts there another ten minutes, this gets them even more brown and crispy which I like. Cook to package direction, I won't bore you with this. Assemble all your ingredients. Enjoy with lovely company and a nice glass of rose wine.